Up in the Great White North, Motherpucker is conducting Round One of the 2011 Best Looking NHL Player. 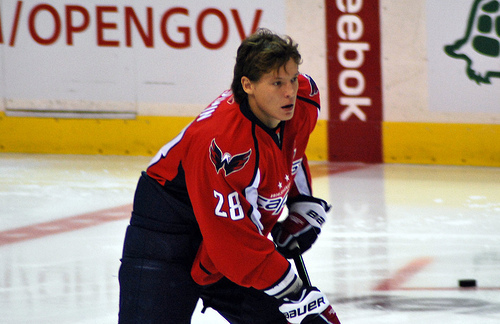 We don’t know what kind of elections they’re used to having up there but any puckstud poll that does not include Sasha Semin reeks of ballot box irregularities and fraud to us. Sasha says, "Write me in!" Caps hunks Greenie and Brooksy made the cut and are currently leading in their respective divisions, but they need your help and support. We don’t think this election is being monitored by any international organizations or even Jimmy Carter for that matter, so transparency, fan accountability and ballot box stuffing is in order. Left and Right wingers, Ted Olson and David Boies, who in 2000 squared off in Bush v. Gore, but are now in lockstep fighting on behalf of Prop 8 in California, have taken the case pro bono. An early afternoon conference call was held and they are ready to go to court, or even the Hague if required, to file the necessary injunctions. Voting ends @ 6pm Mountain time, which is… Dunno, I can’t do the math. VOTE! This entry was posted in Uncategorized and tagged Election fraud, Olson and Boies, sasha. Bookmark the permalink. Haha yeah I’m sure there is a little stuffing going on with all the Blackhawks fans promoting the snot out of this. We’ll see how round 2 goes! Voting irregularities in Chicago? Unheard of.